July was a month of installation and commissioning. By August we were learning the brewing ropes at 10HL scale. In September we sold beer and celebrated. The Irish Craft Beer and Cider Festival at the RDS was the ultimate baptism of fire for a newly-fledged micro-brewery, but we pulled it off and had the immense satisfaction of seeing throngs of people enjoy our beers. We met more beer enthusiasts over a 4-day period than we normally would in a year and learned fast how to pull pints at a busy bar. A week later (and just under 6 months since breaking ground) it was time to celebrate. The brewery became a party venue and Margaret and Garrett’s yard was transformed into a wonderful beer garden for a day, complete with the most authentic garage a band could ever hope for. Rathmullan House fed us like kings, In Their Thousands played their hearts out, Rachel spun digital discs, and our guests — family, friends and loyal supporters — gathered in numbers to help us toast this little brewery into the future. A night to remember. We quickly moved on to our Dublin draught launch in The Black Sheep on 19 September. Kinnegar’s national draught debut was made quietly in late August at Logues bar in Carrigart, where Aengus continues to beat the craft beer drum with passion. 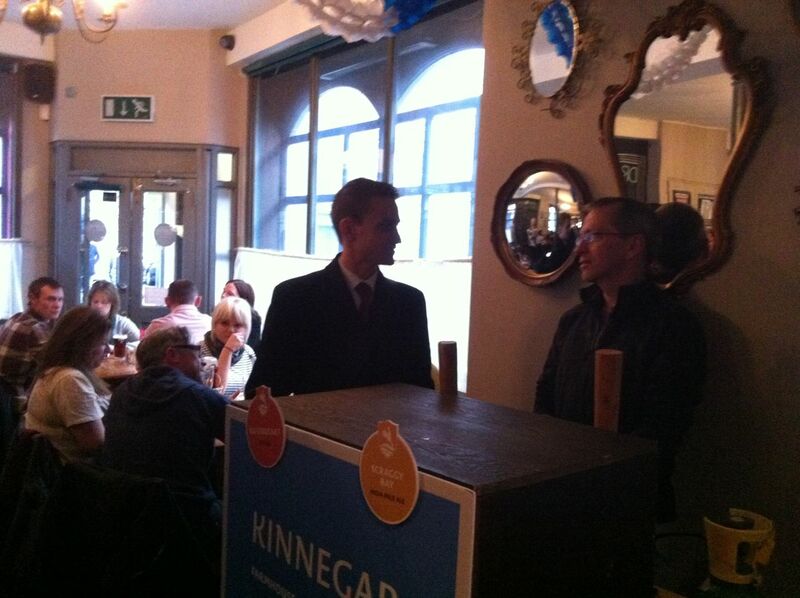 Thanks to everybody who turned out to help drain the kegs in Capel Street and Carrigart. And now it’s October. Rick has pulled (half) pints of Limeburner and Devil’s Backbone at the Lighthouse cinema where Alex Fegan’s documentary, The Irish Pub, was launched this week in style. We were honoured to serve Kinnegar to the great and the good of the Irish pub scene. Fine Irish beer to celebrate a great Irish institution. This entry was posted on October 4, 2013 by kinnegarbrewing. It was filed under A brewery grows .